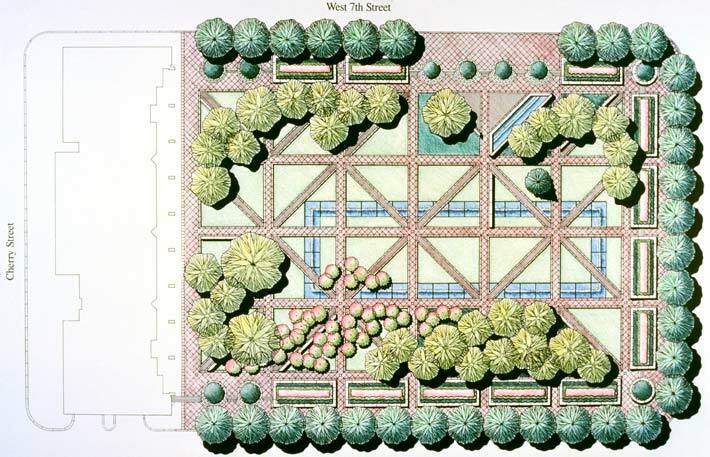 PWP's design of Burnett Park began as the rehabilitation of an urban park originally laid out by George Kessler in 1919. The park consists of two strong geometrical systems—granite paths that are elevated above the lawn, and a series of pools that form a rectangular figure enlivened by fiber optic rods and water jets. Existing groves of trees and shrubs—live oak, road oak, crepe myrtle, and old magnolias are sprinkled across the strong geometries. The park which contains a “fountain room” with lighted jets and a wall of four bronze reliefs by Matisse is connected to a plaza by Isamu Noguchi. In 2010, PWP redesigned parts of the plaza to include play areas and equipment for children.